Follow Highway 1 West toward Horseshoe Bay. Before Horseshoe Bay, take the Squamish - Whistler exit (#0 or 1), onto Highway 99 North, also known as the Sea to Sky Highway. Once on Highway 99 North, past Horseshoe Bay, the trip to Whistler can vary depending on road conditions and traffic. Remain on Highway 99 North until you reach Whistler. Take your time as you will pass by several lakes, towns and view points along the way. Two major viewpoints include Black Tusk and Shannon Falls. For details of stop-off points take a look at our Sea to Sky blog post. Whistler is about a 4 to 5-hour drive from Seattle. The trip to from Seattle to Vancouver takes about 3-hours. 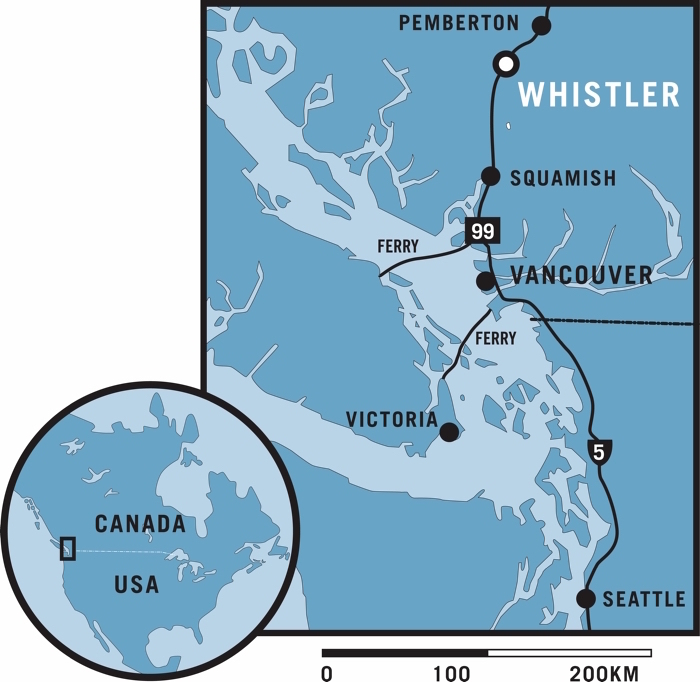 The Vancouver-Whistler drive takes about 2 hours, depending on road and traffic conditions. During heavy peak traffic times travelers can take the alternate Truck Border crossing by using Exit 275, off of I-5, before getting to the main Douglas Border crossing. Drivers can then follow the Pacific Highway (also known as 176th Street or Highway 15) through Surrey, over the Cloverdale Bypass to Highway 1 (the Trans Canada Highway). Exit onto Highway 1, traveling west, and follow the highway out of Surrey, over the Port-Mann Bridge, through Port Coquitlam, Burnaby and East Vancouver. Highway 1 then travels over the Ironworkers' Memorial Second Narrows Bridge, through North and West Vancouver toward Horseshoe Bay. Before Horseshoe Bay, take the Squamish - Whistler exit (#0 or 1), onto Highway 99 North, also known as the Sea to Sky Highway. Follow the directions to Whistler below. When you reach the 41st Avenue intersection, turn left and travel west until you see the next major intersection - Granville Street. Turn right on to Granville and head north on Granville, which will lead you over the Granville Street Bridge into downtown Vancouver. Once across the bridge, stay to the left, follow the off-ramp around and exit via the Marine Drive West turnoff towards West Vancouver. Once on Marine Drive get in the right-hand lane, as you will be making the first right onto Taylor Way. After traveling up the hill on Taylor Way, turn left onto Highway 1 West towards Horseshoe Bay. Before Horseshoe Bay, take the Squamish - Whistler exit (#0 or 1), onto Highway 99 North, also known as the Sea to Sky Highway. Follow the directions to Whistler below. The Whistler Transit system is free and easy to use. Even if you've arrived at Whistler with a car, it's often more convenient to keep your car parked during your stay and travel to and from the Village via the free bus system. All of the Blackcomb Peaks rentals are located on or near the bus route. Learn more about the Whistler Transit system. It is recommended that your car is equipped with proper snow/winter tires for the drive from Horseshoe Bay to Whistler. If you have all-season tires, please carry chains and know how to put them on. In case of heavy snowfall, a shovel and road salt are advisable. Even if you drove a car to Whistler, many of our guests prefer to take advantage of Whistler's transit system while staying with us.